I urge you to vote NO on Trump’s extreme nominee Thomas Farr, nominated to the United States District Court for the Eastern District of North Carolina. Farr is a go-to litigator for vote suppressors, defending disenfranchisement campaigns after the Supreme Court’s decision that dismantled the VRA, as well as partisan and racial gerrymandering, and obstacles for eligible voters trying to register. This is urgent… Trump and the Far-Right are winning in their efforts to pack our federal courts with extreme narrow-minded elitist judicial nominees. To date, Trump and McConnell have confirmed 29 appeals court judges and 53 district court judges, PLUS two Supreme Court justices. Nominated by Trump to the United States District Court for the Eastern District of North Carolina, Thomas Farr is much more than just a run-of-the-mill advocate of voter suppression -- his history of disenfranchising voters of color is long. He reportedly played a role in a notorious voter intimidation campaign aimed at Black voters in 1990, when he worked for ultraconservative then-Senator Jesse Helms. Majority Leader Mitch McConnell is hell-bent on following through with his promise to "plow right through" with judicial nominees -- but with your voice we can derail this extreme nominee who has no place serving on the bench. 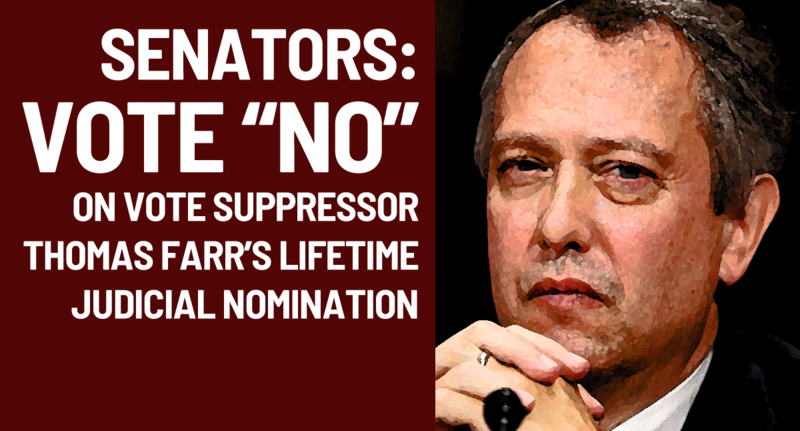 Tell your Senators to vote NO Thomas Farr for a lifetime appointment!